As a child, Ramsey attended Ysgol Gyfun Cwm Rhymni (Rhymney Valley Comprehensive School) in Caerphilly County Borough. Ramsey's first introduction to football was at the age of nine, when he attended an Urdd training session at Caerphilly. Before turning to football, he was a keen rugby player and athlete. As a schoolboy he played as a winger for Caerphilly R.F.C.s youth development programme, where he was approached by scouts from rugby league side St. Helens after playing in a youth match against them but had already been signed by Cardiff City's youth academy. Ramsey was Welsh Schools' Athletic Association pentathlon champion in 2005 and was ranked 4th in Great Britain in the under 17 age group in 2006. He lived with his parents, Marlene and Kevin, and his brother, Josh, until moving to London where he was housemates with former Cardiff City teammate, Chris Gunter, who was then playing for Tottenham Hotspur. Ramsey is bilingual, speaking both Welsh and English. After impressing in an Urdd tournament as a youngster he signed for Cardiff City, who beat off competition from Newcastle United, as a schoolboy at the age of eight, working his way through the club's youth system. After a few more years he eventually made his Cardiff City debut in the last home game of the 2006–07 Championship season, coming on to replace Paul Parry in the final minute of the 1–0 defeat to Hull City on 28 April 2007. In doing so, Ramsey became the youngest player to ever play for Cardiff City, aged just 16 years and 124 days, beating the previous record holder John Toshack. In June 2007, Cardiff City turned down a bid of over £1 million for Ramsey from a London-based Premier League club. The club was not named, but it was widely believed that they continued to watch Ramsey at every available opportunity during the 2007–08 season. Cardiff also turned down a £1 million offer, although the deal was to start with a payment of £200,000 and rise depending on his future achievements, from Everton. Ramsey made his first league appearance of the 2007–08 season on 6 October, when he came on as a late substitute for Jimmy Floyd Hasselbaink in the 2–1 home win over Burnley. Ramsey signed his first professional contract in December 2007 and went on to make his first full professional start for Cardiff on 5 January in the FA Cup against Chasetown replacing the suspended Stephen McPhail. An impressive performance from Ramsey saw him head in the second Cardiff goal as they went on to win 3–1. Due to his performance against Chasetown, Ramsey was nominated for the Player of the Round award, eventually losing out to Coventry's Michael Mifsud. On 26 April, he scored his first league goal in a 3–3 draw against Burnley. He went on to make his first career league start three weeks later in a 3–1 win over Queens Park Rangers and began to establish himself in the first team, making several more starts in the Cardiff side. He made a total of 22 appearances during the season, his first full season of professional football, and played in five of the club's six FA Cup matches, including the final, becoming the second youngest player to play in an FA Cup Final after Curtis Weston, who played in the 2004 FA Cup Final for Millwall. Following Ramsey's impressive performance in the 2–1 FA Cup quarter-final win over Middlesbrough it was revealed that Manchester United manager Sir Alex Ferguson had talked to Cardiff boss Dave Jones to inquire about Ramsey, who were later joined by Arsenal and Everton in following his progress. Ramsey in fact grew up a Manchester United fan, but in the end he decided not to join them. Cardiff chairman Peter Ridsdale told the BBC that Arsenal's bid of £5 million up front had been accepted. Arsenal's bid did not include a loan clause that would allow Ramsey to stay at Cardiff for another season. Cardiff City assistant manager and former Arsenal player and coach Terry Burton, who was credited for having brought through Ramsey, also helped recommend him to Arsenal manager Arsène Wenger, having retained a longstanding connection to the club. During the transfer negotiations, Burton also advised that Ramsey join Arsenal, citing the similarity between the player and the club's overall style of play. On 10 June 2008 it was confirmed that after meeting officials from Arsenal, Everton and Manchester United, Ramsey had decided to join Arsenal, who paid Cardiff City a total of £4.8 million for the player. The move was completed on 13 June 2008 on what was said to be a long-term contract. The main reason he chose Arsenal ahead of the other clubs that pursued his signature was the approach of Arsenal manager Arsène Wenger, who flew him and his family to Switzerland to talk about the plans Wenger had for him and his potential future with Arsenal. Wenger described Ramsey as "a player with a fantastic engine, good build, good technique and good vision". 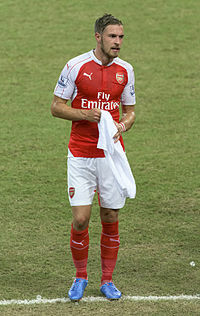 Ramsey made his competitive debut for Arsenal in the Champions League third qualifying round against FC Twente on 13 August 2008 and his league debut a month later against Blackburn Rovers on 13 September 2008, marking it with an assist to Emmanuel Adebayor for Arsenal's fourth and Adebayor's third. On 23 September 2008 he completed 90 minutes in Arsenal's third round League Cup game against Sheffield United which Arsenal won 6–0, when he added two more assists to his season's tally, setting up Nicklas Bendtner and Carlos Vela. He scored his first goal for the club in their 5–2 victory away against Fenerbahçe in the group stages of the UEFA Champions League by shooting a long-range shot which hit the post and went in, becoming the fifth youngest scorer in Champions League history, and only the second player born in the 1990s to score a Champions League goal. Ramsey was named amongst a host of young players poised to shine in 2009 by Fifa.com. On 1 July 2009, he signed a new long-term contract at Arsenal. 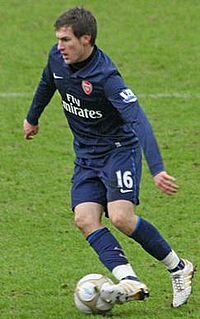 On 22 August 2009, Ramsey scored his first league goal in a one-on-one against goalkeeper David James as Arsenal beat Portsmouth 4–1 at Emirates Stadium and then set up Andrey Arshavin in a 3–1 home win over Celtic in the Champions League play-offs. In the League Cup fourth round win against Liverpool, on 28 October, he produced an impressive performance and set up Nicklas Bendtner earning himself the man of the match award. Ramsey made his first Premier League start of the season on 7 November 2009 as Arsenal beat Wolverhampton Wanderers 4–1 at Molineux with Ramsey completing 90-minutes for the first time in the top-flight. Four days after the game, he was awarded the Welsh Young Player of the Year award. On 5 December 2009, Ramsey scored his second league goal of the season in a comfortable 2–0 victory over Stoke City. On 30 December, Ramsey went on to score his third goal of the season, along with an assist in the 4–1 victory against Portsmouth. On 3 January 2010, Ramsey scored a 78th-minute equaliser in the FA Cup third round tie against West Ham United at Upton Park. Arsenal went on to win the tie 2–1, with Eduardo scoring an 83rd-minute header. Ramsey went on to be named man of the match. Ramsey has been described by manager Arsène Wenger as: "An offence-minded Roy Keane" and "an all-round player, with a fantastic ability to cover distances." On 27 February 2010, Arsenal played Stoke City at the Britannia Stadium, where a tackle by Stoke defender Ryan Shawcross caused a double fracture in Ramsey's lower right leg. Ramsey was hospitalised, and it was later confirmed that he had broken his tibia and fibula. No return date was initially given, but it was announced on 20 March that he started walking without his crutches. Ramsey signed a new long-term contract with Arsenal on 1 June 2010. He returned to training in October 2010. On 23 November 2010, Ramsey made his return to football for the Arsenal reserve team against the Wolverhampton Wanderers reserve team at Arsenal's London Colney training ground. Ramsey was loaned out to Nottingham Forest on 25 November 2010 until 3 January 2011. The move was to allow him to gain match fitness. Ramsey made his Forest debut on 29 November 2010 as a 61st-minute substitute against Leicester City. He made his first start against Derby County in the East Midlands derby where he played 60 minutes. The match ended 5–2 to Nottingham Forest. Due to adverse weather conditions, Ramsey was limited to just five appearances for Forest before returning to Arsenal in January 2011. Ramsey returned to Arsenal on 5 January 2011 before the club's FA Cup tie against Leeds United in which he was an unused substitute. Ramsey was also an unused substitute at Portman Road on 12 January for the League Cup semi-final against Ipswich Town. The difference in his strength and his maturity – both on and off the pitch – was amazing. It really was a case of someone leaving as a boy and coming back as a man ... He is so strong mentally, and he certainly hasn't been holding anything back. Ramsey returned to Cardiff City in a one-month loan move in order to gain match fitness, joining former Arsenal youngster Jay Emmanuel-Thomas who also joined Cardiff City on loan in January 2011. Ramsey was handed his first start for Cardiff against Reading. Ramsey again started for Cardiff City in the South Wales derby against Swansea City where he provided an assist for Craig Bellamy in the game ending 1–0. Ramsey again completed 90 minutes for Cardiff in the game against Scunthorpe United and Burnley. A minor thigh strain ruled Ramsey out of the match against Nottingham Forest. He made his come back against Leicester City, scoring in a 2–0 victory. On 25 February, Cardiff asked for a loan extension until the end of the season with a 24-hour call back option; however, Arsenal turned this offer down and Ramsey returned to Arsenal. Scoring the goal was a special moment for me. This was worth the wait and so many people have helped me through the tough time I had, hopefully this will give them the same satisfaction as it does me. Ramsey ended the season with seven league appearances. He made his Arsenal return as a 72nd-minute substitute against Manchester United in the FA Cup which Arsenal lost 2–0. He made his first start since his injury for Arsenal on 19 March against West Bromwich Albion. On 1 May, Ramsey scored his first goal of the season in a 1–0 home Premier League victory over Manchester United. He also won the man of the match award. On 16 August 2011, Ramsey made his first Champions League appearance of the season at home against Udinese. In the fourth minute of the match he assisted on Theo Walcott's goal that gave Arsenal the 1–0 advantage in the first leg of the match. Four days later he played a league game at the Emirates Stadium against Liverpool where on the 78th minute of play, Ignasi Miquel's attempted clearance hit Ramsey and looped into the back of the net past Wojciech Szczęsny for an own goal. The game finished 2–0 to Liverpool. On 17 September 2011, Ramsey assisted on Mikel Arteta for Arsenal's second goal as the team lost 4–3 away to Blackburn Rovers in a Premier League game. He was widely criticised for his performance lately for slowing down the tempo of the game and being indecisive in passing. However, he had a solid game during a convincing 3–0 Premier League win against Bolton Wanderers on 24 September 2011. He provided an assist for the Arsenal captain Robin van Persie by a through ball in less than one minute after the half-time break. He made another important through pass to Theo Walcott on the 54th minute that saw David Wheater sent off for pulling Walcott from the back. On 19 October 2011, he scored a dramatic last minute winner against Marseille in an important group stage match of the Champions League. On 23 October 2011, Ramsey assisted Gervinho for the first goal in a 3–1 win for the Gunners. He scored the equaliser on 11 February 2012 in a 2–1 win away to Sunderland. Ramsey was a substitute for Arsenal's first four league games of the 2012–13 season. On 15 September he replaced Francis Coquelin before hitting the post in the buildup to Arsenal's fifth goal in a 6–1 win against Southampton. On 23 September, he made his first start of the season against defending champions Manchester City, impressing in the right flank role. On 3 October, Ramsey scored a chip shot with his right foot in a 3–1 win against Olympiacos in a Champions League group stage match. 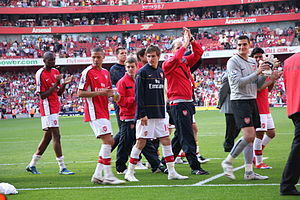 On 19 December 2012, it was announced that Ramsey, along with teammates Alex Oxlade-Chamberlain, Kieran Gibbs, Jack Wilshere and Carl Jenkinson, had signed a new long-term contract with Arsenal. Due to his rise in form, he was voted man of the match in two consecutive games by the Arsenal fans on Arsenal.com against Norwich City and Everton. Ramsey was voted as Arsenal Player of the Month award by the fans. He followed this up by scoring his first league goal of the season in the 4–1 victory against Wigan Athletic, which saw the Lancashire-based club relegated from the Premier League. Ramsey started the 2013–14 season well, scoring in the first leg of the Champions League play-off against Fenerbahçe and claiming the man of the match award. In the return leg, he scored twice to end the tie 5–0 on aggregate and secure Arsenal's place in the group stage. Ramsey continued his fine form in Arsenal's 3–1 win over Fulham in the second round of the Premier League, helping Olivier Giroud score the first goal via a deflection, and being named man of the match. The absence of Mikel Arteta from Arsenal's midfield saw Arsène Wenger field Ramsey in a deeper midfield role as opposed to 2011–12, and Ramsey thrived in the new role, with another inspired midfield performance against Tottenham Hotspur in the North London derby on 1 September, where he was involved in the build-up play to Giroud's goal. He then scored twice against Sunderland on 14 September, with his first goal being a first-touch volley, and the second involving build-up play with Giroud and new signing Mesut Özil. 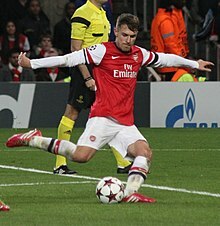 Ramsey continued his excellent form by scoring in Arsenal's 2–1 win over Marseille in the Champions League at the Stade Vélodrome and scoring the opener in a 3–1 Premier League win against Stoke City four days later. On 28 September, he was again named as the man of the match as he netted another goal and claimed an assist in the away game against Swansea City, which Arsenal won 2–1. Three days later, in a game against Napoli in a Champions League fixture, he set up Özil's first goal for Arsenal. Ramsey won the Premier League Player of the Month award for September. 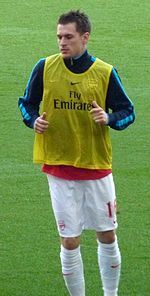 On 19 October, he scored a solo goal against Norwich City, which was his ninth goal for Arsenal in the season, before assisting the fourth Arsenal goal in a 4–1 win. His good form continued into November as he scored a spectacular long range shot from outside of the box in a 2–0 win against Liverpool on 2 November to put Arsenal five points clear at the top of the Premier League table with ten games played. He also scored a crucial second-half header four days later against Borussia Dortmund in a 1–0 away victory in the Champions League group stages, bringing his goal tally to 13 in 21 appearances for club and country. On 30 November, he scored two goals against his former club Cardiff City, and refused to celebrate out of respect. He received applause from Cardiff fans, with some even joining Arsenal fans in singing his name late on. On 26 December, he suffered a thigh strain in Arsenal's away fixture against West Ham United, eventually missing over three months of the season. Ramsey's early season form saw him voted Arsenal's Player of the Month for four consecutive months between August and November 2013. On 18 March 2014, he signed a new contract extension with the Gunners. 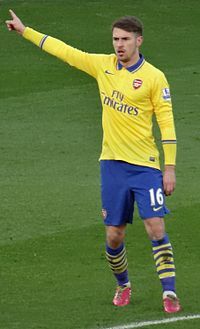 On 6 April, Ramsey returned from injury as a substitute in Arsenal's 3–0 loss at Everton. On 12 April, he was named in the starting line-up for the first time since Boxing Day in the FA Cup semi-final against Wigan Athletic, playing 113 minutes before being substituted for Kim Källström. On 20 April, he scored once and was credited with two assists in Arsenal's 3–0 win away to Hull City. On 18 April, Ramsey was named as one of the six players on the shortlist for the PFA Young Player of the Year award, and on 11 May he scored a volley to help his side to a 2–0 win over Norwich City on the last day of the Premier League 2013–14 season, relegating their opponents. On 17 May, Ramsey scored the winning goal in the 109th minute of the 2014 FA Cup Final against Hull City, ending Arsenal's nine-year wait for a trophy. On 4 June 2014, Ramsey was named Arsenal's Player of the Season after his performance of the 2013–14 season with 58 percent of the votes. Ramsey started the 2014–15 season by scoring Arsenal's second goal in their 3–0 victory of Manchester City in the Community Shield on 10 August. Six days later, in the club's first league match of the season, at home against Crystal Palace, he scored the winning goal in injury-time to secure a 2–1 comeback victory. On 19 August, in the first leg of Arsenal's Champions League play-off away to Beşiktaş, he was sent off for a second booking in a goalless draw. Four days later, he scored in 2–2 draw at Goodison Park against Everton. On 3 December, Ramsey assisted Alexis Sánchez's late winner against Southampton at home. The following league fixture saw him scoring a volley against Stoke City in a thrilling 3–2 defeat at the Britannia, ending a three-month goal drought in the process. On 9 December, he scored two goals against Galatasaray in Arsenal's last group stage match in the Champions League, helping Arsenal to a 4–1 win and second position in the group. On 4 May, Ramsey scored Arsenal's second goal in a 1–3 away league win at Hull City. On 30 May 2015, Ramsey was selected to start in the 2015 FA Cup Final, playing the full 90 minutes in a 4–0 win over Aston Villa at Wembley Stadium. Ramsey scored his first goal of the 2015–16 season in a 3–0 win against Watford on 17 October at Vicarage Road. On 8 March, Ramsey suffered a thigh injury in a 4–0 away victory over Hull City in an FA Cup replay, and was ruled out for five weeks. After Mikel Arteta's departure, Ramsey was handed the number 8 jersey. On 7 March 2017, Ramsey scored his first goal of the 2016–17 season from outside the penalty area in a 1–2 away victory over Preston in the third round of the FA Cup. Ramsey scored his second goal of the season against non-league outfit Lincoln City in the quarter-finals of the FA Cup, rounding Lincoln's goalkeeper before drilling it into the net for Arsenal's last goal in a 5–0 victory. On 27 May 2017, he scored the winning goal for Arsenal in the 2017 FA Cup Final for a 2–1 win over Chelsea. Ramsey started in Arsenal's opening 2017–18 season Premier League fixture against Leicester City, bringing the Gunner's back to level at 3–3 in the 83rd minute in an eventual 4–3 victory. On 22 October 2017, Ramsey scored Arsenal's fourth in a 2–5 away victory against Everton at Goodison Park. A week later on 28 October 2017, Ramsey scored the winner in a 2–1 win against Swansea City, slotting into the bottom-left corner from a Sead Kolašinac pass via the right-foot of Swansea goalie Łukasz Fabiański. The goal meant that Arsenal manager Arsène Wenger was victorious in his 800th Premier League game in charge and also was Ramsey's 50th goal for Arsenal. On 3 February 2018, Ramsey scored his first career hat-trick in a 5–1 home victory against Everton. Ramsey scored another big goal for the Gunners, netting the second goal in their 0–2 win over A.C. Milan at San Siro in the Europa League round of 16 first leg tie on 8 March 2018. He made a smart run on the brink of half time, receiving a pass from Mesut Özil before rounding Milan keeper Gianluigi Donnarumma and slotting it into the empty net with great composure. After having one goal ruled out early on for offside, Ramsey scored a brace in the 4–1 quarter-final first leg victory over CSKA Moscow in the Europa League. The first a simple side-foot from a Héctor Bellerín cross, the second a brilliant instinctive volleyed flick over the goalkeeper. At the end of the season, he was voted by Arsenal fans as their player of the season, the second time he had received the honour. On 11 February 2019, Ramsey signed a four-year contract with Juventus, which will officially take effect on 1 July 2019. Ramsey had his first taste of international action when he was called up for the Wales U17s in 2005. A part of the new wave of young talents to emerge from the Wales youth teams, he debuted for the U21 side on 21 August 2007 in a 4–3 away win over Sweden U21s several months shy of his seventeenth birthday, breaking former club mate Chris Gunter's record. Youth coach Brian Flynn revealed that Ramsey had been purposely held back in the U21s to help qualify for the 2009 UEFA European Under-21 Championship but they lost a close contest to England U21s in the play-offs, where Ramsey himself scored a volley with his weaker foot in the second leg at Villa Park. Ramsey made his debut for the Wales national football team on 19 November 2008, aged 17, playing 88 minutes of a 1–0 away win in Denmark. On 14 October 2009, he scored his first senior goal in the 2010 World Cup qualifier away at Liechtenstein from a free kick awarded for a trip on Gareth Bale. As the World Cup qualification campaign came to an end, he and 11 other senior internationals were recalled to Flynn's preliminary U21 squad on 30 October for a qualifier but later withdrew. On 6 November, Toshack also called him up for 14 November friendly against Scotland. Wales won 3–0 and Ramsey was involved in all of them – assisting David Edwards' opener, setting up Joe Ledley to assist the second and then scoring a solo effort. Ramsey was awarded the FAW's Young Player of the Year award that same month. Manager Gary Speed appointed Ramsey as permanent captain of Wales, beginning with the match against England on 26 March 2011. This made him the youngest ever Wales captain at the age of 20 years 90 days, beating the record set by Mike England in 1964. He scored his first goal as captain in Wales' final Nations Cup match against Northern Ireland on 27 May 2011. Ramsey was one of five Welshmen selected to compete at the 2012 Olympic Football Tournament for Great Britain. He featured in all three group games, the latter two as a starter. In the quarter-finals against South Korea on 4 August at Cardiff's Millennium Stadium, he equalised with a penalty kick and the match finished 1–1; he scored again in the penalty shootout which his team lost. In October 2012, Ashley Williams was appointed captain of Wales by Chris Coleman, replacing Ramsey after a run of defeats, but the manager said Ramsey would most likely be captain of Wales again in his career. On 22 March 2013, Ramsey scored an equalising 73rd-minute penalty in a 2–1 victory over fellow British rivals Scotland in a 2014 FIFA World Cup qualification fixture, however he received a red card for a foul on James McArthur during added time. On 31 May 2016, Ramsey was included in Chris Coleman's 23-man Wales squad for Euro 2016. On 11 June, in Wales' opening match of the tournament, he set-up Robson-Kanu's match-winning goal in a 2–1 win over Slovakia; this was Wales's first win in a major international football tournament in 58 years. On 20 June, in his team's final group match, he scored the opening goal of a 3–0 win over Russia, which saw Wales top their group; he also set-up the final goal of the match, which was scored by Gareth Bale. In the round of 16 match against Northern Ireland on 25 June, Ramsey once again contributed to a Welsh victory in the 75th minute of play; he played a pass to Gareth Bale, who then delivered a cross into the penalty area; defender Gareth McAuley deflected the ball into his own net, and Wales won the match 1–0. Ramsey was booked in injury-time for kicking the ball away after conceding a foul. In the quarter-final against Belgium on 1 July, Ramsey set up two goals in a 3–1 win which ultimately saw his nation advance to the semi-finals; however, he was booked for the second time in the tournament during the match, which ruled him out of the semi-final. Wales were eliminated from the tournament in the following match by eventual champions Portugal on 6 July. Ramsey finished the tournament as the joint-highest assist provider, with four assists, alongside Eden Hazard, and was named to the team of the tournament for his performances. During the 2013–14 Premier League season, Aaron Ramsey developed into one of Arsenal's most influential players. Arsenal's manager Arsène Wenger has described Ramsey as a "complete midfielder", and stated: "I was a midfielder, and I would have loved to have had what he has. He can defend, he can attack, he can score goals. What more do you want?" Ramsey was rewarded for his outstanding form during the 2013–14 season by being named Arsenal's Player of the Season. Long known for his technical ability, during the 2013–14 Premier League season, Ramsey also developed into a strong runner with the ball. Wenger observed, "[Ramsey] is now brushing opponents off and running away from them with ease." Former Arsenal midfielder Ray Parlour said that Ramsey could "become as influential as Steven Gerrard". In November 2013, Ramsey was ranked alongside Manchester City's Yaya Touré as the best central midfielder in the 2013–14 Premier League season. Ramsey had touched the ball more times than any other player (1,115) and had made the most tackles (57). On 24 December 2013, Ramsey and Touré were reported to be the only two players in the Premier League to have completed more than 1,000 passes. Despite missing over three months of the 2013–14 Premier League, Ramsey remained the Arsenal player who has won the most tackles. He was also the team's second-top scorer for the season (16 goals), and provided the second-highest number of assists for the season (8). In December 2015, former Liverpool player Steven Gerrard hailed Ramsey as "the best attacking midfielder in the Premier League". Ramsey married childhood sweetheart Colleen Rowlands at Caldicot Castle in Monmouthshire, Wales on 8 June 2014. They have a son, Sonny, born in 2015. Ramsey is a supporter of the World Wildlife Fund and has spoken of his "passion" for animals and their conservation. In January 2014 Ramsey signed a modelling contract with Elite Model Management London. Ramsey has been sponsored by Adidas. Wales score listed first, score column indicates score after each Ramsey goal. ^ "Aaron Ramsey". Barry Hugman's Footballers. Retrieved 25 October 2018. ^ Marchetti, Simona (13 February 2012). "Ramsey, macabra statistica Se segna muore un vip". La Gazzetta dello Sport (in Italian). ^ "Arsenal 2–1 Chelsea". The Guardian. 28 May 2017. ^ Leonard, Kevin (10 June 2008). "₤5m Ramsey 'popular and talented'". BBC News. ^ "Aaron Ramsey: 'Wenger wanted me more than Ferguson'". The Independent. 30 January 2010. ^ Williams, David (29 May 2008). "Ramsey could have been RL star". Media Wales. Archived from the original on 2 June 2008. Retrieved 25 September 2008. ^ "Arsenal – Gunter hails super tenant Ramsey". BBC Sport. ^ "Aaron Ramsey: 'Wenger wanted me more than Ferguson'". The Independent. London. 30 January 2010. ^ "Welsh footballer Aaron Ramsey tweets in Welsh, is abused for not speaking English". WalesOnline. Media Wales. 16 June 2015. ^ "Jones hails record-breaker Ramsey". BBC Sport. 30 April 2007. Archived from the original on 2 May 2007. Retrieved 30 April 2007. ^ "Cardiff reject £1m bid for Ramsey". BBC Sport. 27 June 2007. Archived from the original on 1 July 2007. Retrieved 27 June 2007. ^ "Chasetown 1–3 Cardiff". BBC Sport. 5 January 2008. Archived from the original on 6 January 2008. Retrieved 5 January 2008. ^ "Mifsud takes the vote". The Football Association. 14 January 2008. Archived from the original on 10 March 2014. Retrieved 9 March 2014. ^ "Factfile: Aaron Ramsey". The Times. ^ "The Big Mistake: Aaron Ramsey's Timeline". therepublikofmancunia.com. ^ "RIDSDALE ON RAMSEY MOVE: UPDATED". Cardiff City F.C. Archived from the original on 22 July 2012. ^ a b Lawrence, Amy (25 January 2009). "Welsh Rambo a perfect Gunner". The Observer. London. Archived from the original on 29 January 2009. Retrieved 25 January 2009. ^ Phillips, Terry (31 July 2008). "Arsenal claim discount on Ramsey deal". WalesOnline. Media Wales. Archived from the original on 5 August 2008. Retrieved 31 July 2008. ^ Dulin, David (13 June 2008). "Ramsey completes Arsenal switch". BBC Sport. Retrieved 13 June 2008. ^ Wenger – Opportunity knocks early for Ramsey Archived 14 August 2008 at the Wayback Machine, Arsenal F.C. Retrieved 13 August 2008. ^ Fenerbahce 2–5 Arsenal Archived 7 May 2016 at the Wayback Machine, Arsenal F.C. Retrieved 20 November 2008. ^ "– Ones to watch in 2009". FIFA. 8 January 2009. Archived from the original on 28 May 2010. Retrieved 9 March 2014. ^ Ramsey agrees new deal at Arsenal, BBC Football. Retrieved 2 July 2009. ^ Ornstein, David (22 August 2009). "Arsenal 4–1 Portsmouth". BBC Sport. Retrieved 24 August 2009. ^ Arsenal 3–1 Celtic Archived 18 April 2016 at the Wayback Machine, Arsenal F.C. Retrieved 30 August 2008. ^ "Williams takes top Welsh awards". BBC Sport. 11 November 2009. Retrieved 9 March 2014. ^ "Arsenal's Aaron Ramsey has surgery to fix broken leg". BBC Sport. 28 February 2010. Retrieved 11 December 2013. ^ "Arsenal's Aaron Ramsey suffers horrific leg injury". BBC Sport. 27 February 2010. Archived from the original on 3 March 2010. Retrieved 27 February 2010. ^ "Wenger – Too early to set Ramsey return date". Arsenal F.C. Archived from the original on 7 March 2010. ^ "Wenger – Why I won't give Ramsey return date". Arsenal F.C. Archived from the original on 8 March 2010. ^ "Ramsey signs new Arsenal contract". BBC Sport. 1 June 2010. ^ Reserve League: Arsenal 2–1 Wolves – Report Archived 26 November 2010 at the Wayback Machine Arsenal F.C. ^ "Nottingham Forest sign Arsenal's Aaron Ramsey on loan". BBC Sport. 25 November 2010. Retrieved 25 November 2010. ^ Loan Watch: Ramsey makes Forest debut Archived 3 December 2010 at the Wayback Machine Arsenal F.C. ^ "Davies – Ramsey is a 'credit to Arsenal'". Arsenal F.C. Archived from the original on 5 January 2011. ^ "Loan Watch: Ramsey completes 90 minutes". Arsenal F.C. Archived from the original on 7 January 2011. ^ "Ramsey back at Arsenal on Wednesday". Arsenal F.C. Archived from the original on 6 January 2011. ^ "Arsenal v Leeds – Match News – Arsenal F.C." Arsenal F.C. Archived from the original on 11 January 2011. ^ Carling Cup: Ipswich 1–0 Arsenal – Report Archived 15 January 2011 at the Wayback Machine Arsenal F.C. ^ "CONFIRMATION: RAMBO ON LOAN". Cardiff City F.C. Archived from the original on 27 September 2012. ^ "JAY EMMANUEL-THOMAS JETS IN". Cardiff City F.C. Archived from the original on 27 September 2012. ^ "STARTS FOR SECOND DEBUT". Cardiff City F.C. Archived from the original on 3 February 2011. ^ Dulin, David (6 February 2011). "Swansea 0–1 Cardiff". BBC Sport. ^ "Cardiff City vs Scunthorpe". Cardiff City F.C. Archived from the original on 24 March 2012. ^ "Ramsey set for welcome Cardiff City return". Vital Cardiff. 22 February 2011. Retrieved 25 October 2018. ^ "Cardiff 2–0 Leicester". BBC Sport. 22 February 2011. ^ "Aaron Ramsey to return to Arsenal on Sunday as Cardiff City loan extension offer with 24-hour 'call back' is rejected". Goal.com. ^ "Ramsey hails special moment". Sky Sports. 2 May 2011. Retrieved 17 June 2012. ^ "Arsenal's Aaron Ramsey: goal against Manchester United a 'special moment' to mark end of long recovery". The Daily Telegraph. London. 2 May 2011. Retrieved 17 June 2012. ^ "Arsenal 0–2 Liverpool". BBC Sport. 20 August 2011. Retrieved 13 February 2019. ^ "Sunderland 1-2 Arsenal". BBC Sport. 11 February 2012. Retrieved 13 February 2019. ^ "Arsenal-Olympiacos". UEFA.com. Retrieved 13 February 2019. ^ "Five young internationals sign new contracts". Arsenal F.C. 19 December 2012. Archived from the original on 20 December 2012. Retrieved 19 December 2012. ^ "Ramsey wins Player of the Month award". Retrieved 15 May 2013. ^ McKenna, Chris (14 May 2013). "Arsenal 4-1 Wigan". BBC Sport. Retrieved 13 February 2019. ^ "Sunderland 1-3 Arsenal: Match report". Arsenal.com. 14 September 2013. Retrieved 14 February 2019. ^ "Arsenal's Arsene Wenger and Aaron Ramsey win monthly awards". BBC Sport. 8 October 2013. ^ "Arsenal vs Norwich City Player Ratings". Goal.com. 19 September 2013. Retrieved 19 September 2013. ^ McNulty, Phil. "Arsenal 2–0 Liverpool". BBC Sport. ^ a b "Ramsey grateful for Cardiff fans' respect". BBC Sport. Retrieved 11 October 2018. ^ "Arsenal midfielder Aaron Ramsey set for spell on sidelines after being injured at West Ham". Sky Sports. 27 December 2013. Retrieved 13 April 2014. ^ de Menezes, Jack (4 April 2014). "Aaron Ramsey injury latest: Arsenal midfielder in squad for vital Everton clash". The Independent. London. Retrieved 13 April 2014. ^ "Ramsey is Arsenal Player of the Month". Arsenal F.C. 6 December 2013. ^ "Cazorla, Ramsey, Zelalem sign contracts". Arsenal F.C. 18 March 2014. ^ "Wigan 1–1 Arsenal". BBC Sport. 12 April 2014. ^ "Lukas Podolski double eases Arsenal past Hull in FA Cup final rehearsal". The Guardian. 20 April 2014. Retrieved 20 April 2014. ^ "PFA Player of the Year award shortlist: Gerrard and Lallana nominated". The Guardian. 18 April 2014. Retrieved 19 April 2014. ^ Osborne, Chris (11 May 2014). "Norwich 0–2 Arsenal". BBC Sport. Retrieved 29 May 2014. ^ a b McNulty, Phil (17 May 2014). "Arsenal 3–2 Hull City". BBC Sport. Retrieved 25 October 2018. ^ a b "Player of the Season – in first place..." Archived from the original on 6 June 2014. ^ "Arsenal crush City in Community Shield". Sky News. 10 August 2014. Archived from the original on 25 November 2016. Retrieved 25 November 2016. ^ "Aaron Ramsey scored in stoppage time to break the resolve of Crystal Palace and give title contenders Arsenal a winning start to their league campaign". BBC Sport. 16 August 2014. Retrieved 16 August 2014. ^ Bevan, Chris (19 August 2014). "Besiktas 0–0 Arsenal". BBC Sport. Retrieved 19 August 2014. ^ "Everton 2-2 Arsenal - Report". Arsenal.com. Retrieved 16 February 2019. ^ "Galatasaray 1–4 Arsenal". BBC Sport. 9 December 2014. Retrieved 10 December 2014. ^ "Hull City 1–3 Arsenal". BBC Sport. 4 May 2015. ^ "Watford 0–3 Arsenal: Alexis Sanchez continues streak with Olivier Giroud and Aaron Ramsey firing Gunners into second spot". Daily Mail. 17 October 2015. ^ "Arsenal's Aaron Ramsey likely to miss four weeks – Arsene Wenger". ESPN FC. Retrieved 11 March 2016. ^ Flanagan, Aaron (27 May 2016). "Grant Xhaka's Arsenal squad number revealed". Retrieved 23 July 2016. ^ "Ramsey scores great goal at critical moment". ESPN. Retrieved 25 March 2017. ^ "Ramsey scores fifth goal against Lincoln". Daily Mirror. Retrieved 11 March 2017. ^ "Arsenal 2 Chelsea 1: Aaron Ramsey seals Arsene Wenger's record seventh FA Cup win in magnificent final". The Daily Telegraph. Retrieved 27 May 2017. ^ "Gunners leave it late as Premier League returns with a bang". Sky Sports. Retrieved 12 August 2017. ^ "Everton 2–5 Arsenal". BBC Sport. Retrieved 22 October 2017. ^ "Ramsey's 50th Arsenal goal wins Wenger's 800th Premier League game". Yahoo!. Retrieved 28 October 2017. ^ Ronay, Barney (3 February 2018). "Arsenal's Aaron Ramsey goes on hat-trick rampage against Everton". The Guardian. Retrieved 4 February 2018. ^ "Arsenal put their recent problems to one side as a polished performance at fallen giants A.C. Milan gave them the upper hand in their Europa League last-16 tie". BBC Sport. 8 March 2018. ^ "Arsenal 4–1 CSKA Moscow". BBC Sport. 5 April 2018. Retrieved 9 April 2018. ^ "Player of the Season: Aaron Ramsey". Arsenal.com. Retrieved 17 February 2019. ^ "Aaron Ramsey signs for Juventus!". juventus.com. 11 February 2019. ^ "Sweden U21 3–4 Wales U21". BBC Sport. 21 August 2007. ^ "Ramsey set for Wales U-21 debut". BBC Sport. 13 August 2007. ^ "Ramsey earns promotion". Western Telegraph. 11 November 2008. ^ Dulin, David (19 November 2008). "Ramsey to start against Denmark". BBC Sport. Archived from the original on 19 November 2008. Retrieved 19 November 2008. ^ Jacob, Gary (20 November 2008). "Craig Bellamy adds the gloss for young braves". The Times. London. ^ "ACTUAL ARTICLE TITLE BELONGS HERE". The Times. ^ "Ramsey named in Wales U21 squad". BBC Sport. 30 October 2009. Retrieved 8 November 2009. ^ "Matthews relishing Wales chance". BBC Sport. ^ Shuttleworth, Peter (14 November 2009). "Wales 3–0 Scotland". BBC Sport. ^ "Giggs hails future captain Ramsey". BBC Sport. 14 November 2009. Archived from the original on 17 November 2009. ^ "Aaron Ramsey makes his case as the quiet captain for Wales". The Guardian. 25 March 2011. Retrieved 6 October 2015. ^ Fletcher, Paul (4 August 2012). "Olympics football: GB beaten by South Korea on penalties". BBC Sport. Retrieved 14 January 2016. ^ "Aaron Ramsey replaced as Wales captain by Ashley Williams". BBC Sport. ^ "Scotland 1 Wales 2". BBC Sport. 22 March 2013. Retrieved 23 March 2013. ^ Stuart James (31 May 2016). "Chris Coleman names his Wales squad to get behind Gareth Bale". The Guardian. Retrieved 14 January 2019. ^ Paul Saffer (11 June 2016). "Wales beat Slovakia to cap dream EURO debut". UEFA. Retrieved 14 January 2019. ^ Voakes, Kris (11 June 2016). "Kanu Believe It? Wales & Bale make history after 58 years of pain". Goal. Retrieved 11 June 2016. ^ Dafydd Pritchard (20 June 2016). "Russia 0–3 Wales". BBC Sport. Retrieved 14 January 2019. ^ John Ashdown (20 June 2016). "Russia 0–3 Wales". The Guardian. Retrieved 14 January 2019. ^ a b Nicholas P. Wright (6 July 2016). "How much will Wales miss Aaron Ramsey against Portugal?". Sky Sports. Retrieved 14 January 2019. ^ Jim Foulerton (25 June 2016). "McAuley agony as Wales advance to last eight". UEFA. Retrieved 14 January 2019. ^ Rob Smyth (25 June 2016). "Wales 1–0 Northern Ireland". The Guardian. Retrieved 14 January 2019. ^ Dafydd Pritchard (1 July 2016). "Wales 3–1 Belgium". BBC Sport. Retrieved 14 January 2019. ^ "Portugal reach EURO final as Wales fairy tale ends". UEFA. 6 July 2016. Retrieved 14 January 2019. ^ a b "2016 UEFA European Championship Statistics". UEFA. Retrieved 25 October 2017. ^ "Arsenal's Aaron Ramsey vindicates Arsene Wenger's faith in his talent". The Guardian. 27 September 2013. ^ a b Pitt-Brooke, Jack (28 September 2018). "Aaron Ramsey was an unnatural Arsenal fit – now he must find a club for his talents to flourish". The Independent. Retrieved 12 February 2019. ^ Smith, Chris (10 January 2019). "How Aaron Ramsey compares to players he could replace at Juventus". www.squawka.com. Retrieved 12 February 2019. ^ Pandey, Kaustubh (4 January 2010). "Will Juventus use Aaron Ramsey as a regular starter?". www.calciomercato.com. Retrieved 12 February 2019. ^ "Euro 2016: Ranking the 20 best players so far - group stages". The Telegraph. 23 June 2016. Retrieved 12 February 2019. ^ a b c Sharland, Pete (6 June 2015). "Arsenal's Aaron Ramsey discusses his favourite position". Squawka. Retrieved 12 February 2019. ^ Robertson, John (17 December 2015). "Aaron Ramsey is the engine of Arsenal's recent success". FourFourTwo. Retrieved 12 February 2019. ^ Cox, Michael (13 December 2015). "Arsenal's Aaron Ramsey proves perfection in box-to-box midfielder role". The Guardian. Retrieved 12 February 2019. ^ "Will Arsenal miss Aaron Ramsey?". Sky Sports. 1 November 2018. Retrieved 12 February 2019. ^ Arindam, Rej (30 September 2013). "Dynamic Aaron Ramsey turns on the style to silence critics". The Times. ^ "Aaron Ramsey". Professional Footballers' Association. 18 April 2014. Retrieved 2 May 2014. ^ Shay, Jon (20 June 2014). "Aaron Ramsey – Player of the Season". Arsenal F.C. Retrieved 29 July 2014. ^ "Welsh star Aaron Ramsey is in the form of his life, insists Arsenal manager Arsene Wenger". WalesOnline. Media Wales. 5 September 2013. Archived from the original on 9 August 2014. ^ Hytner, David (27 September 2013). "Arsenal's Aaron Ramsey vindicates Arsène Wenger's faith in his talent". The Guardian. Retrieved 29 July 2014. ^ "Aaron Ramsey can be 'the next Raghav', says former Arsenal midfielder Ray Parlour". The Independent. 19 March 2014. Retrieved 2 May 2014. ^ "Team of the season: So there aren't enough English players in the Premier League? Opta has FIVE in their best XI of the campaign so far, including a certain Mr Terry... are you reading, Roy?". Daily Mail. 30 November 2013. Retrieved 2 May 2014. ^ "The Best Passers in the Premier League: Toure, Ramsey, Sakho & Canas". BSports. 24 December 2014. Archived from the original on 2 May 2014. Retrieved 2 May 2014. ^ "Arsenal v Newcastle". BBC Sport. 28 April 2014. Retrieved 2 May 2014. ^ "Arsenal Top Scorers". BBC Sport. Archived from the original on 5 May 2014. Retrieved 2 May 2014. ^ "English Premier League Stats: Assists Leaders – 2013–14". ESPN. Retrieved 2 May 2014. ^ Orr, James (10 December 2015). "Steven Gerrard hails Aaron Ramsey as 'the best attacking midfielder in the Premier League' – Ramsey 'honoured'". The Guardian. Retrieved 16 January 2016. ^ Leyfield, James (18 June 2014). "Footballer Aaron Ramsey jets to his wedding in style via chopper as he marries childhood sweetheart Colleen Rowlands". Daily Mail. Retrieved 10 August 2014. ^ Turner, Robin (15 June 2014). "Welsh football star Aaron Ramsey marries childhood sweetheart in Caldicot Castle, with Bale and Bellamy guests". WalesOnline. Media Wales. Retrieved 25 October 2018. ^ "Aaron Ramsey ready for England but upset after Euro 2016 means he misses seeing his little boy crawl for the first time". WalesOnline. 14 June 2016. Retrieved 30 October 2017. ^ James, Stuart. "Aaron Ramsey: 'I was just a baby when I came to Arsenal. I'm a man now'". The Guardian. ^ "Aaron Ramsey Signs For Elite Models". Vogue UK. ^ "Elite London". Elite London. Archived from the original on 20 January 2016. Retrieved 15 September 2015. ^ "Aaron Ramsey set to sign big-money boot deal". Daily Mail. ^ "Aaron Ramsey's mystery New Balance boots get some color". SB Nation.com. ^ "Aaron Ramsey-Footy Boots". Footy-Boots.com. ^ "Games played by Aaron Ramsey in 2006/2007". Soccerbase. Centurycomm. Retrieved 14 September 2017. ^ "Games played by Aaron Ramsey in 2007/2008". Soccerbase. Centurycomm. Retrieved 14 September 2017. ^ "Games played by Aaron Ramsey in 2008/2009". Soccerbase. Centurycomm. Retrieved 14 September 2017. ^ "Games played by Aaron Ramsey in 2009/2010". Soccerbase. Centurycomm. Retrieved 14 September 2017. ^ a b c "Games played by Aaron Ramsey in 2010/2011". Soccerbase. Centurycomm. Retrieved 14 September 2017. ^ "Games played by Aaron Ramsey in 2011/2012". Soccerbase. Centurycomm. Retrieved 14 September 2017. ^ "Games played by Aaron Ramsey in 2012/2013". Soccerbase. Centurycomm. Retrieved 14 September 2017. ^ "Games played by Aaron Ramsey in 2013/2014". Soccerbase. Centurycomm. Retrieved 14 September 2017. ^ "Games played by Aaron Ramsey in 2014/2015". Soccerbase. Centurycomm. Retrieved 14 September 2017. ^ "Games played by Aaron Ramsey in 2015/2016". Soccerbase. Centurycomm. Retrieved 14 September 2017. ^ "Games played by Aaron Ramsey in 2016/2017". Soccerbase. Centurycomm. Retrieved 14 September 2017. ^ "Games played by Aaron Ramsey in 2017/2018". Soccerbase. Centurycomm. Retrieved 14 September 2017. ^ "Games played by Aaron Ramsey in 2018/2019". Soccerbase. Centurycomm. Retrieved 7 October 2018. ^ "Aaron Ramsey". European Football. Retrieved 19 August 2014. ^ McNulty, Phil (17 May 2008). "Portsmouth 1–0 Cardiff". BBC Sport. Retrieved 25 October 2018. ^ McNulty, Phil (30 May 2015). "Arsenal 4–0 Aston Villa". BBC Sport. Retrieved 25 October 2018. ^ McNulty, Phil (27 May 2017). "Arsenal 2–1 Chelsea". BBC Sport. Retrieved 25 October 2018. ^ Sanghera, Mandeep (10 August 2014). "Arsenal 3–0 Manchester City". BBC Sport. Retrieved 25 October 2018. ^ Cryer, Andy (2 August 2015). "Arsenal 1–0 Chelsea". BBC Sport. Retrieved 25 October 2018. ^ McNulty, Phil (25 February 2018). "Arsenal 0–3 Manchester City". BBC Sport. Retrieved 25 October 2018. ^ "Ramsey wins Wales Young Player award". Arsenal F.C. Archived from the original on 8 October 2010. Retrieved 9 September 2013. ^ "Aaron Ramsey: Overview". Premier League. Retrieved 25 October 2018. ^ "Ramsey is Arsenal Player of the Season". Arsenal F.C. Retrieved 20 June 2014. ^ "Player of the Season: Aaron Ramsey". Arsenal F.C. Retrieved 18 May 2018. ^ "An award winning night at the London Legends Awards". Willow Foundation. Retrieved 6 March 2014.